Wahrscheinlich würde sich Hermann Hase nicht sehr darüber freuen, wenn man ihn als Osterhasen bezeichnen würde. Zum Glück treibt er sich grade Gott weiß wo rum, und kriegt es also nicht mit. 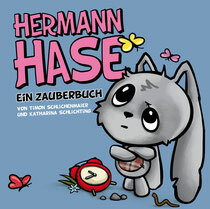 Auf jeden Fall ist sein Buch "Hermann Hase – Ein Zauberbuch" das perfekte Geschenk zu Ostern! Ein Mutmachbuch für Kinder ab 5 Jahre. Hier können Sie es direkt bestellen. Hello, all is going fine here and ofcourse every one is sharing facts, that's in fact excellent, keep up writing. Have you ever thought about adding a little bit more than just your articles? I mean, what you say is valuable and all. However think about if you added some great images or videos to give your posts more, "pop"! Your content is excellent but with pics and videos, this blog could certainly be one of the most beneficial in its niche. Superb blog! I'm amazed, I must say. Seldom do I come across a blog that's both equally educative and entertaining, and let me tell you, you've hit the nail on the head. The problem is an issue that too few folks are speaking intelligently about. Now i'm very happy that I stumbled across this in my hunt for something regarding this. I every time spent my half an hour to read this weblog's articles daily along with a mug of coffee. You actually make it appear so easy with your presentation however I in finding this topic to be actually one thing that I think I'd never understand. It kind of feels too complicated and very extensive for me. I am looking forward to your next publish, I will try to get the hang of it! I was more than happy to uncover this site. I want to to thank you for your time for this fantastic read!! I definitely appreciated every little bit of it and i also have you saved to fav to check out new things on your blog. What i do not understood is if truth be told how you're no longer actually a lot more neatly-preferred than you might be right now. You're very intelligent. You realize therefore significantly on the subject of this subject, made me personally believe it from a lot of various angles. Its like men and women are not interested until it is one thing to accomplish with Woman gaga! Your individual stuffs outstanding. All the time handle it up! This article provides clear idea designed for the new people of blogging, that really how to do running a blog. Great information. Lucky me I ran across your website by chance (stumbleupon). I've saved as a favorite for later! This is very interesting, You are a very skilled blogger. I've joined your rss feed and look forward to seeking more of your magnificent post. Also, I've shared your site in my social networks! Why people still use to read news papers when in this technological globe the whole thing is existing on net?